I'm a serial plant killer. There I said it, glad that is off my chest, it feels so much better to have that out in the open. For all of my craftiness mojo I have been blessed with it seems I make up for it with my lack of horticulture mojo. Don't get me wrong, my garden does ok... but only because I let Mother Nature do 99% of the work. Any plant brought into the house though, that's a different story. I feel sorry for any plant brought into my home either by myself, or by some wonderful friend or relative who gifted me with said plant. Any plant brought into my home is pretty much guaranteed a one-way ticket to that lovely garden in the sky. It's only a matter of time - trust me I know. That's what it looked like when I got it in July. Yes a mere month and a half ago. I won't show you what it looks like now, I'm too ashamed. Honestly it would be completely dead if Mr. PD hadn't stepped in and taken over caring for it. You think I would have inherited my mom's green thumb - I would have been happy with just a fingernail! My mom doesn't even have to try. Everything sprouts, blooms, and grows for her. She called me the other day and told me how she had eaten some cherries and so she took a few of the pits out of her mouth and "tossed" them into a flower pot. 2 weeks later they have sprouted! Cherries People! I've seen mossy terrariums popping up all over the internet. You can find tons on Etsy and Flickr. I gave it a go at some of these lovelies in TN and guess what? YES I killed them! ok it was through no fault of my own, well sort of. I recently got in touch with Patricia of DoodleBirdie on Etsy. She has some of the greenest, prettiest terrariums I have seen. She was kind enough to answer my main question: Why did my terrariums die? She got to the root of the problem very quickly. It seems my terrariums died simply because I didn't have them in an enclosed environment. She had some open air moss gardens and told me that even she killed them some times! It seems it is a lot harder to keep the moss alive in an open container! So I made some terrariums and they have been alive for the last month!!! They are even green, healthy and growing!!! 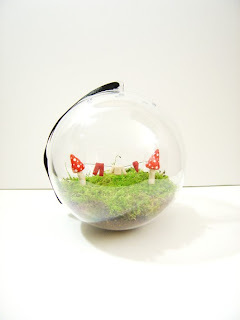 I will be posting a tutorial early next week on how to make your own mossy garden terrariums. If you are not up to making your own or already have one, head on over to DoodleBirdie's and she'll set you up. 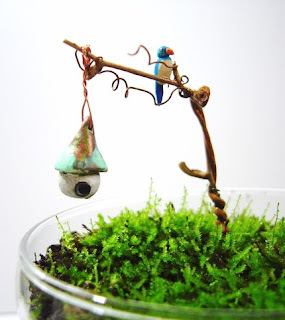 She's got mossy gardens and the cutest terrarium decor I have seen! What a CUTE terrarium! I came over from Quilt Taffy, saw your comment there. Can you tell me WHERE you found the fine tip metal tip for the Elmer's Glue???? Thanks! I, too, have a brown thumb. So it's nice to see somebody other than me finally admit to something like this. I'll have to check into the moss, because I love live plants. But they don't love me.